Dynamic Cart Messaging is a feature that has been proven to increase average order size. 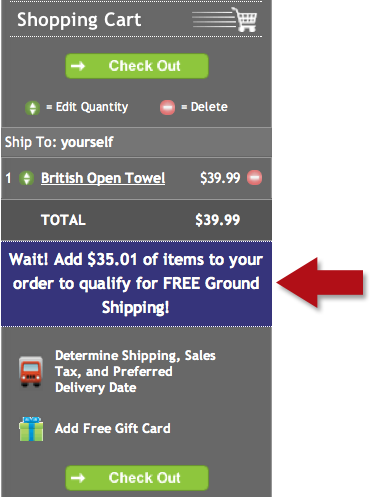 Many ecommerce sites offer incentives to customers if they order more items. Perhaps there is a free shipping incentive once the customer orders a certain dollar amount of products. In other cases, it might be a percentage off if the customer orders a certain number of products. Regardless, this upsell tactic only works if the consumer knows about it. Putting dynamic messaging in the shopping cart itself is the best way to "sell" customers on ordering more from you. If you are interested in learning more about how your company can utilize Nexternal's Dynamic Cart Messaging to increase average order size, please call 800-914-6161.